This was one of the early items in my store, and one that people have really enjoyed. I recently updated it for 2014. It is a cute set of free printables. It is a number sequencing activity for Pre-k, Kindergarten,1st grade (review) and homeschoolers. It is CCSS aligned and will reinforce counting, and number sense development, while practicing number order. The worksheets are tiered, so you can first work with the numbers 1-10, and then move up to numbers 11-19, when your students are ready. The object of the activity is to look at a set of numbers, with number(s) missing, determine what the missing number(s) are, and write or paste the correct number where the monkey graphic is... hence why I called it Monkey in the Middle. I hope your students have fun with these worksheets. I also enjoy creating clip art, as well as teaching products. 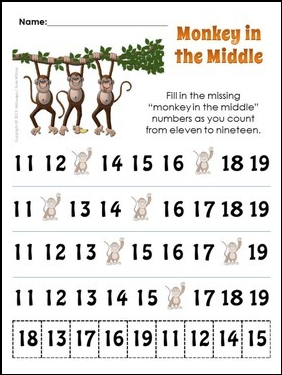 This freebie is a good example of both, as I designed both the monkey graphics, and the printable activities. I hope it will give you an idea of my work and you'll be back to see some of my other paid and free products. NOTE: This portion of this item is included in a series of Kindergarten math centers and games that are aligned with Common Core. These are available as individual units, or bundles by Common Core domains. If you are interested in the rest of the Kindergarten Math series, just click the link: Kindergarten Math Series! Thank you for your interest and please remember to come back and give a rating! Copyright © 2013 Jean Wilson / JWDesigns All rights reserved.